If we are asked to act in a play without knowing the script, it is much harder – almost impossible. In a similar way, when people from different cultures encounter one another, they cannot make the routine ‘assumptions’ about behaviour and nuances that they do when they meet someone from their own culture - the 'script' is different and often unknown. However, in reality, most people do make these assumptions, often without even being mindful about them. And if one is from a majority or high power culture, then this lack of cultural intelligence would mean that the bosses dictate the language and mannerisms, and impose them on everyone. There is a common script, but no understanding of the cultural nuances of the language nor the effectiveness of the message to people from other cultures. Little accommodation or sensitivity is displayed about cultural difference. Cultural Intelligence requires three key ingredients – knowledge about one's own own culture and sub-conscious biases, and of the culture of the person one is dealing with, mindfulness about the differences, and skills to operate cross-culturally. It is not simple, and requires effort and reflexivity. These are the core recommendations in the excellent book: Cultural Intelligence – Living and Working Globally, by David Thomas and Kerr Inkson. An example of cultural intelligence is when we have a boss from a foreign country who rather than jumping into orders and decisions, stops and reflects, makes effort to understand our own culture, and adapts his/her actions and behaviours to the different circumstances. Cultural Intelligence is not a formula or set of rules - it is a skill which needs to be nurtured and cultivated. One of the core motivations of Diverse Ethics is to provide this cultural bridge to leaders so that they may operate effectively cross-culturally by maximising the benefits, both to themselves and their organisation. We do this through providing training, cultural experiences and cultivating reflexivity and mindfulness. Our research for several years in Britain has shown that in spite of the huge global cultures that live and work in Britain, cultural intelligence amongst a majority of leaders is at best very low. 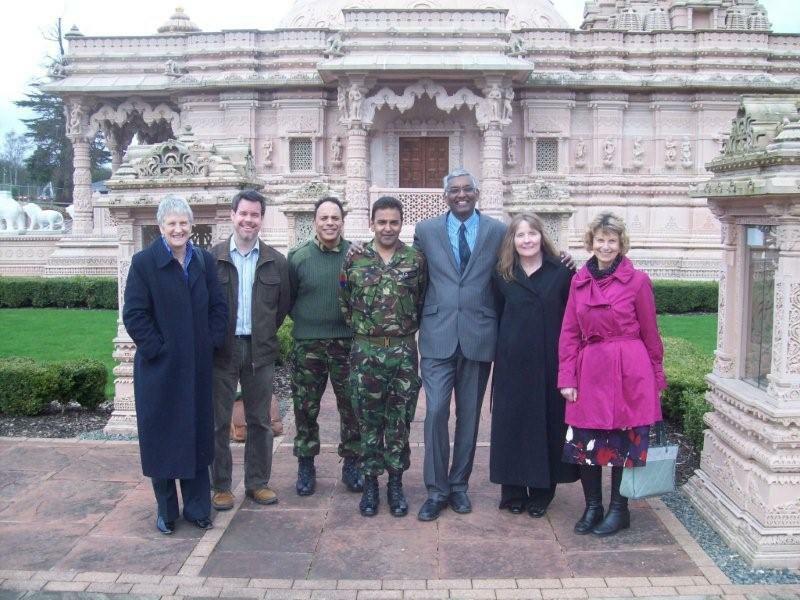 They display this through feeling uncomfortable when they are with groups of people who are different from their own, keeping their core management team very male and mono-cultural so that its behaviour is predictable and controllable, and a general lack of sensitivity to cultural differences and nuances – e.g. expecting all societies to be individualistic and people to be task-oriented and culture neutral. For global organisations, a lack of cultural intelligence and sensitivity among leaders is a sure recipe for disaster. Yes it is true that multi-cultural teams can be tough to mould, but when they do gel, their innovative capabilities are very unique and can take the organisation to levels it would not even have dreamed of. Thomas and Inkson give beautiful case studies and examples of how these sensitivities can be developed, and why it is that mindfulness is such a positive asset. Immigrants to Britain often come with huge enthusiasm and skill – a desire to work hard and progress in this sophisticated and professional society. Britain’s education structures and institutions have a huge amount to offer to people – that is why it continues to be such a draw on immigration. However, in the schools and universities, there is very little training or cultivation of cultural intelligence. This is why teachers and students often come out thinking in stereotypical ways, and subconsciously believing that ‘British’ culture is the best and there is little need to learn other languages and be sensitive to people from different world-views and beliefs. Research shows that over 60% of workers in Britain suffer from ‘identity stress’ – they feel they have to switch their identities when they go to work. We recommend that leaders learn to value cultural intelligence, to invest in it, and to encourage the cultivation of this skill among all employees. They need to change their actions and behaviours to embrace cultural diversity, which also means that they should learn to share power with culturally different people and not be afraid of doing so. Realising that cross-cultural relationships can be difficult, leaders should see the potential for personal and organisational growth and innovation, and want to harness them positively and pro-actively. They should not suppress the challenge, nor avoid it. To contact Diverse Ethics for help in this area, click here. HANSA'S - FOOD WITH SPIRIT - A Review of a unique book on Indian vegetarian cooking. ALL IN ALL - A fascinating story of a young person determined to bring peace and tolerance in spite of personal adversity. LEADERS CAN INSPIRE EACH OTHER - Diverse Ethics can bring different groups together to share best practice and get inspired. 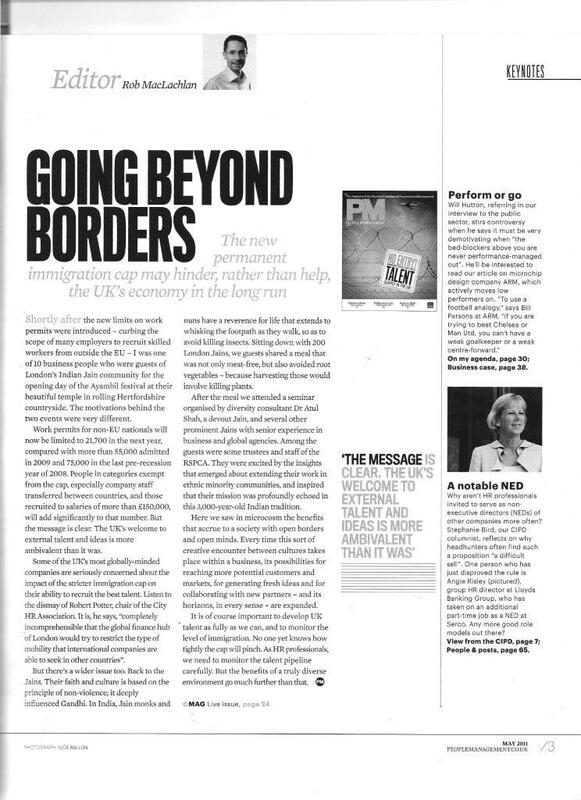 HR press coverage - Our culture tour was reported in an editorial in People Management Magazine.